Paros is a larger island in the Cyclades, known for its beaches, Naoussa nightlife and traditional villages. Highlights include a visit to its main town called Parikia, the Byzantine church called Panagia Ekatontapiliani which was built in the 4th century A.D. Kolimbithres is one of the most interesting beaches where you’ll find naturally sculpted rocks that seem they are out of a Salvador Dali painting. 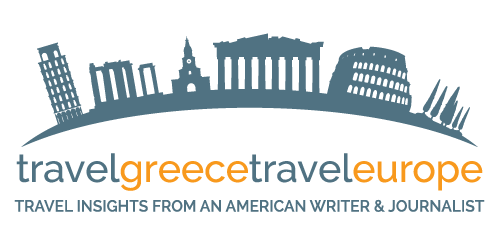 International travelers can stop in Athens first then take another flight or ferry. Check the best international flight deals on Vayama here. There are daily boats to Paros from the port of Piraeus. During the summer, there are also connections from the port of Rafina. Trip time is 3-5 hours, depending on the type of boat. There are also connections from other Cycladic islands including Santorini, Mykonos, Naxos and Syros. In the summer, there is a ferry from the port of Herakion in Crete. For your ferry travel, I highly recommend Blue Star Ferries. Paros’ airport is near Alyki. Flights connect Paros with the Athens airport. Flights are 30 minutes. Paros is a big island so a car could be convenient for some days on the island. Check out deals with Avis Europe. You can also rent scooters and quads on the island at various family-run shops. There is also a public bus system. To get to many of the beaches, you can take small boats that make stops along the coast. Svoronos Bungalows – These apartments are a fantastic base in Naoussa. The aparments are equipped with a kitchen, sitting spaces and balconies. The family-run atmosphere is friendly and the whole property itself is well kept with authentic local charm. Definite value for money. Naoussa Hotel – These rooms and apartments are set right on the road before you reach Naoussa. Walking distance to beaches. A simple and immaculate family run establishment. Kanale’s – These cozy rooms built in traditional Cycladic style are nice base in Naoussa. Walking distance from the harbor. The Piperetto restaurant’s dining balcony offers a perfect view. A plus on service here too. The Cycladic inspired pool with a bridge was my saving grace during a heat wave. Paliomylos – A good friend of mine runs this fantastic boutique hotel. Set above the harbor it is within walking distance to all the good stuff in Naoussa. Known for its spa and excellent service. 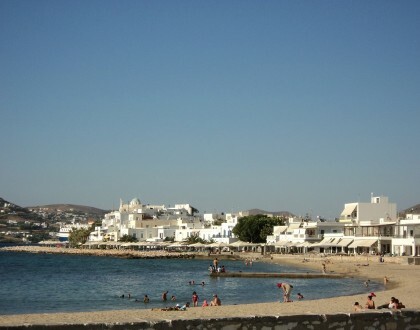 Astir of Paros – For a luxury stay, head to Astir of Paros which is just outside of Naoussa. Beautiful pool and great service.